So I've been looking into getting a prerunner for the past two days and came across a really good deal on a 04 Tacoma but it wasn't a prerunner. I prefer the prerunner for its stance and trim as I'm sure most do but my question is can a regular Tacoma be converted to a pre runner or is it a different chassis all together? So not a simple deal of getting a junk prerunners suspenison pieces? "If you look underneath both of these trucks you will see immediate differences. The first thing that struck me was just how much smaller, thinner, narrower, and generally weaker a lot of the front end components appear by comparison to the Prerunners. The minis are just smaller lighter trucks. Before we bought our Prerunner I was considering lifting the mini. But once I had a look under the Prerunner it became immediately obvious that the Prerunner was the better one to build up. So we did the 4wd conversion, lift, etc. on the Prerunner and left the mini stock. It could have gone either way initially, until I got my hands on the Prerunner for comparison. In the rear end the main difference you will notice first is that the Prerunners are spring over axle and Minis are spring under, which keeps them closer to the ground." Bummer.... Thanks bro bro. Guess ill be looking for a pre runner or 4wd TRD Tacoma. No problem man! You could always just lift the Tacoma! Ya I guess so but it just dosent seem the same for some reason besides the obviously weaker part now... Thanks anyways bro. On the hunt for one in 30 min. Hahaha anytime man! It was an interesting read up. What exactly do you plan to do with the truck? If you're not wheeling/bashing it on rocks I wouldn't be too concerned with strength, I.E. towing and making wrecker yard raids on it. 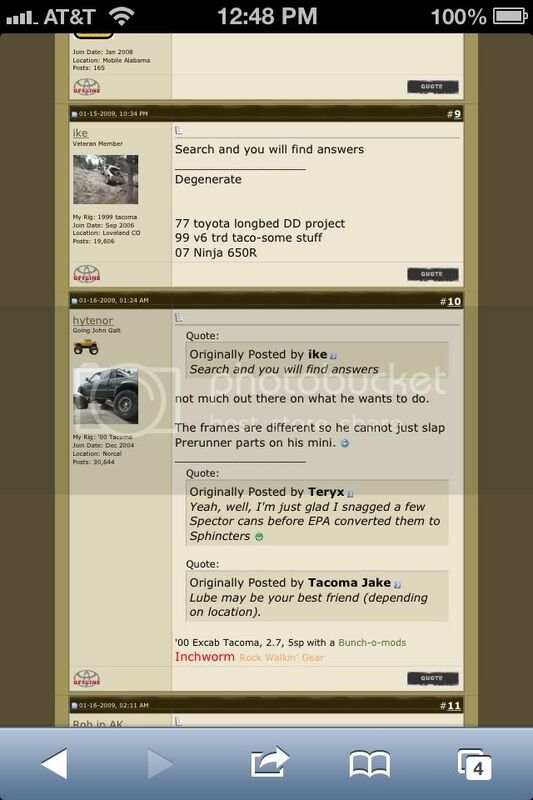 Again hopefully you come across deals in your search for a PreRunner. My best friends brother has an older one that's lifted and on 35s, thing is BRUTE. IMHO you'd be straight with a Tacoma, AEs are light as! I want a sweet newer Tacoma, or a old 80s Land Cruiser yeeeeaaah!!!!! I have no money!!! Plenty of these back where I'm from, I need a job so I can go get some awesome Corona wagons from my old neighbour. I thought you were talking about building a pre-runner truck. I was gonna be like uh... yeah... there are lots of prerunner tacomas... lol.